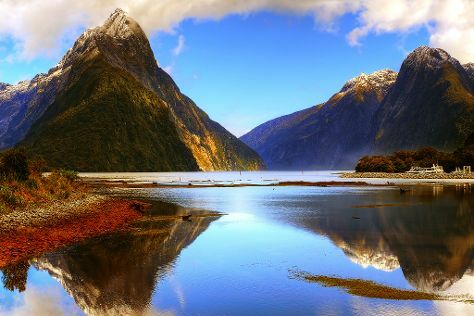 Far-flung New Zealand has become known for its astounding topography, singular biodiversity, varied climate, and for marrying native Maori and post-colonial European cultures on its two main islands and the multitude of smaller landmasses dotted around them. Free-spirited New Zealanders cultivate a love of sports, sustainability, and the outdoors. Far from other landmasses, the islands existed for millions of years before being inhabited by humans, so an abundance of species have come to thrive in the thick, wild rainforest, vast and rugged backland, and extensive surrounding marine areas. While much of New Zealand tourism centers around adventures through this spectacular scenery, take time to explore the nation's rich cultural heritage as well. The traditions and history of the Maoris, and the industry and internationalism of the descendents of the first European settlers endure in fascinating attractions, ranging from museums, to farms, to places of worship. New Zealand is in South Pacific. Plan your visit to New Zealand and other destinations in New Zealand using our New Zealand trip planner.